Brigid was born in AD 450 at Faughart near Dundalk, Louth, Ireland. Her father, Dubhthach, was a pagan chieftain of Leinster and her mother, Broicsech, was a Christian. Brigid spent her earlier life cooking, cleaning, washing and feeding the animals on her father’s farm. She lived during the time of St. Patrick and was inspired by his preaching’s and she became a Christian. When Brigid turned eighteen, she had decided that she would spend her life working for God by looking after poor, sick and elderly people. Brigid’s charity angered her father because he thought she was being too generous to the poor. When she finally gave away his jewel-encrusted sword to a leper, her father realised that she would be best suited to the religious life. Brigid finally got her wish and entered the convent. She received her veil from St. Macaille at Croghan and made her vows to dedicate her life to God. She settled with seven others at the foot of Croghan Hill for a time and about the year 468, followed Mel to Meath. News of Brigid’s good works spread and soon many young girls from all over the country joined her in the convent. 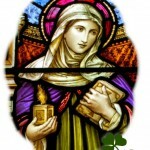 Brigid founded many convents all over Ireland; the most famous one was in Co. Kildare. It is said that this convent was built beside an oak tree where the town of Kildare now stands. Around 470 she also founded a double monastery, for nuns and monks, in Kildare. As Abbess of this foundation she wielded considerable power, but was a very wise and prudent superior. The Abbey of Kildare became one of the most prestigious monasteries in Ireland, and was famous throughout Christian Europe. She founded a school of art at Kildare, where the Book of Kildare, a famous illuminated manuscript, was created. 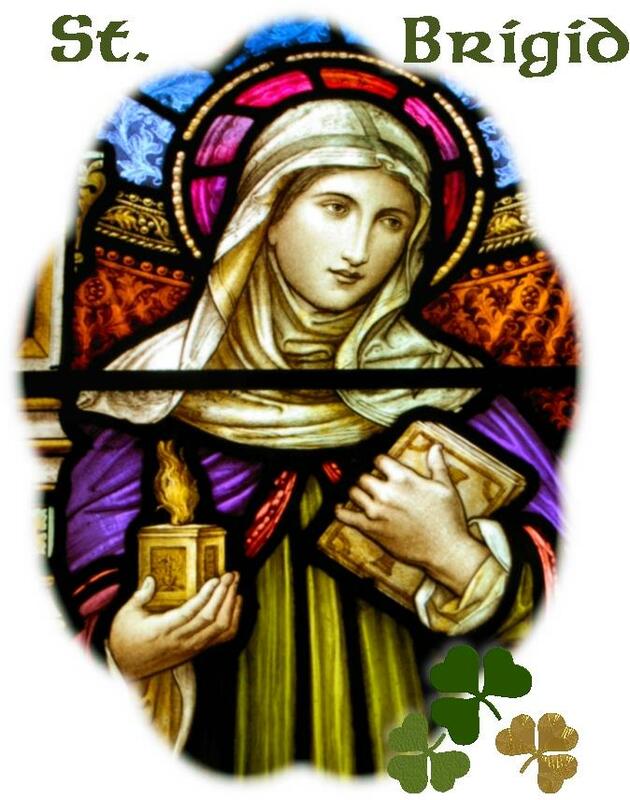 St. Brigid, also known as Mary of the Gael, died at Kildare on February 1 and is buried at Downpatrick with St. Columcille and St. Patrick.